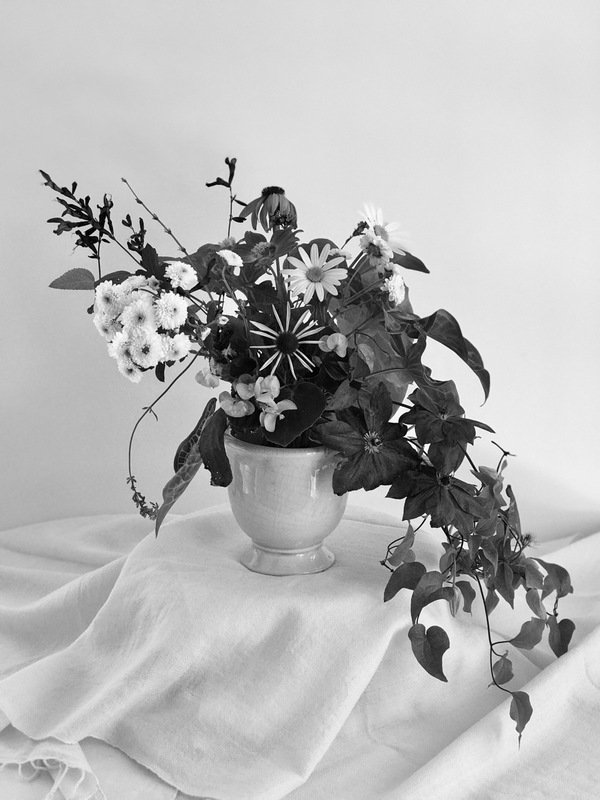 On January 14, 2014 I began creating weekly vases and participating in a popular ritual called “in A Vase On Monday.” Hosted by Cathy at Rambling In The Garden, “In A Vase On Monday” has intrigued and enticed people across the globe to share some flowers, foliage, berries and branches plucked mostly from their gardens. But before I was in the know about it, Cathy had already been building a community of floral enthusiasts for months. This week Cathy is celebrating the Five-Year Anniversary of her first Monday vase posting. I cannot thank her enough for providing this unique coming-together of garden bloggers. Mondays are made better seen through her eyes, with Cathy-style plants, props and commentary. So thank you Cathy and Happy IAVOM Anniversary! To mark her fifth anniversary Cathy challenged contributors to create a (Not) In a Vase on Monday this week. Every idea I came up with for presenting my flowers seemed to still need a container. So I am sneaking in a vase while declaring it is I who cannot be contained. I cannot contain my enthusiasm for this last collection from the garden, picked before our first dip below freezing. Though I gathered some sasanquas just in case, there were plenty of other colorful choices to use instead today. 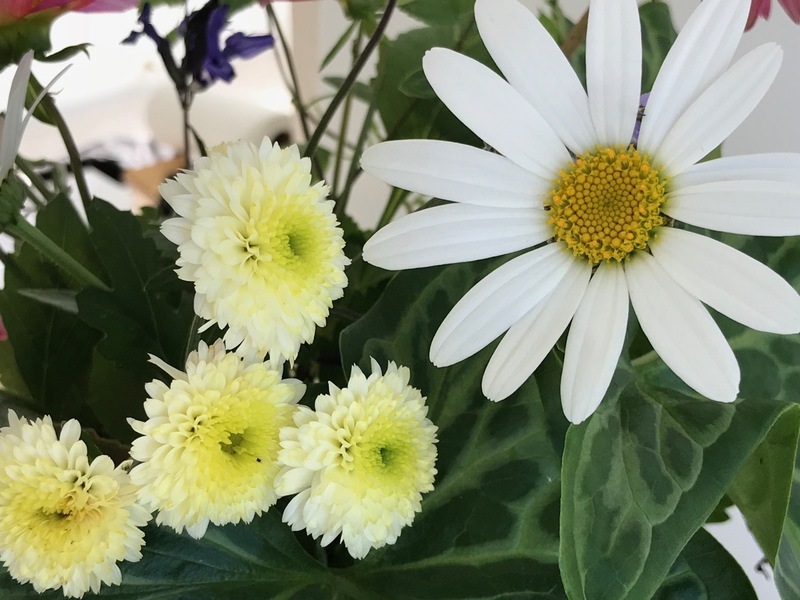 A few pristine Shasta daisies seem to defy the season. I plucked them first. Next are pale yellow button chrysanthemums just coming into bloom, passalongs from my mother’s first cousin, Virgie. She shared many, many of her plants with me and I have had them now for a good part of my life. My uncontainable enthusiasm though mainly is reserved for the Jackmanii clematis, whose large purple blooms always bring a smile to my face—especially so in November. I envisioned them cascading beyond the vase and they more or less achieved my vision. Arum leaves dance in proximity on the right side of the design. Again, happy anniversary and thanks to Cathy at Rambling In The Garden for hosting and giving us an opportunity to share flower designs across the world. Visit her to discover what she and the other wonderful contributors have found to place In A Vase On Monday. 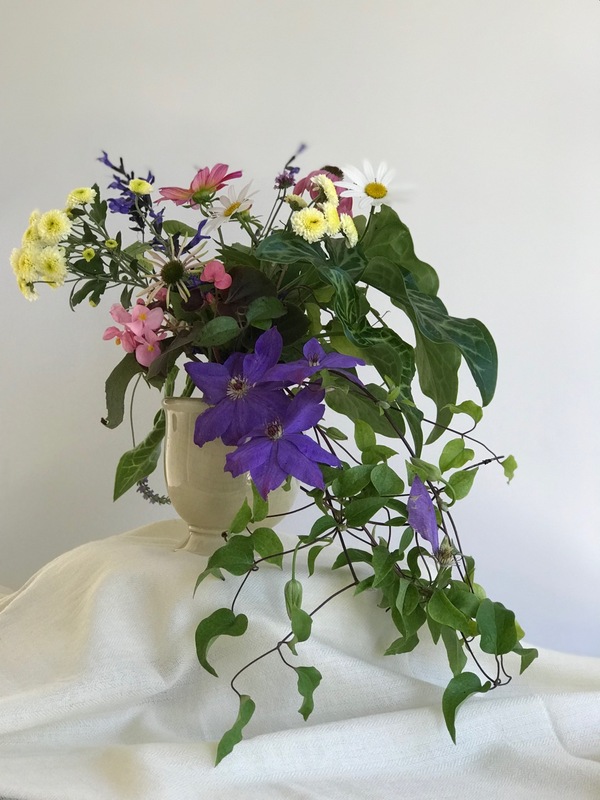 This entry was posted in garden and tagged 2018vase, Arum Italicum, clematis jackmanii, flower design, garden photography, in a vase on monday, winter gardening on November 12, 2018 by pbmgarden. I’m usually much more reserved! Clever! Un-contained is the perfect way of thinking of all our enjoyment of Cathy’s meme. How lovely that you still have such gorgeous flowers to share. Mondays have been more interesting since joining in Cathy’s meme. Jackmanii is the first and only clematis I’ve been able to grow successfully. Thanks for sharing your memory of it. I like the black and white photo. It gives a different perspective. Thanks, I felt the B&W turned out well (they don’t often show such balance). I love the black and white photo. It certainly makes that colorful display feel entirely different. My paternal grandmother grew that particular Clematis on an old chicken coop. Even as a young person, I was blown away by how spectacular it was. Happy (Not) IOVM. Thanks Cathy. I’ve learned much from you and the many participants as well. Ha! Good one, that’s a cunning way to to circumvent the rules. And I can’t contain my delight at your beautiful arrangement. I am amazed that the clematis is still in bloom, it is gorgeous. And what a darling little chrysanthemum. A really stunning arrangement Susie. I’m usually pretty careful to follow rules. Getting feisty in my “wiser” years. Hey, that’s cheating! . . . Isn’t it? I think I would have gotten pictures of the flowers while still out in the garden, but then, they would be contained in the garden. . . . so it is not as simple as it sounds. Thanks Eliza. Other times I’d have been reluctant to clip off so much of the clematis but with the freeze warning out for that evening, I decided to go ahead. Hehe, we are all the same. I do like things trailing from a vase and the clematis is gorgeous. Thanks Alison. The clematis did its job well today. Both your enthusiasm and talent cannot be contained! 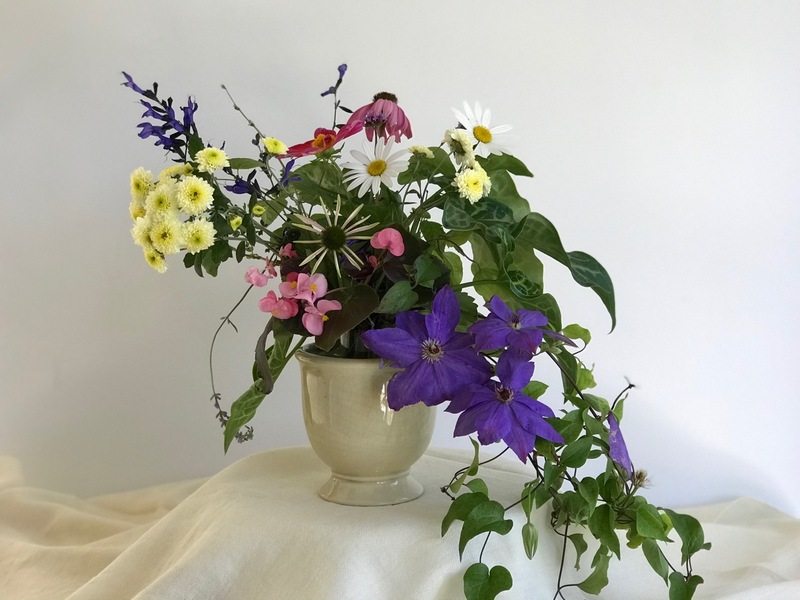 A wonderful arrangement and I love the trailing clematis, the train on your celebratory gown! Thank you Peter–how kind! 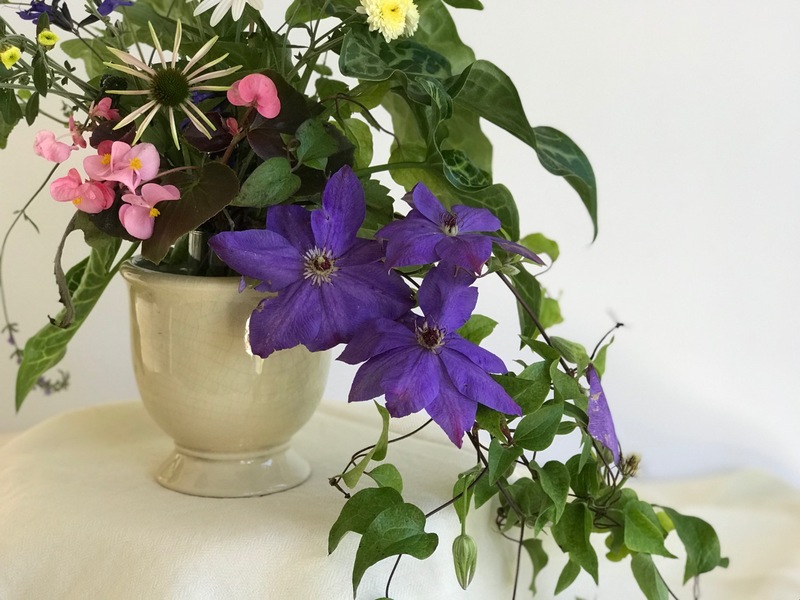 The clematis really made this arrangement pop today. I think you did a great job celebrating Cathy’s IAVOM anniversary, both with your words and with your floral creation. I’m glad you didn’t let the advance of cold weather contain you. I love the arrangement, particularly the elegant Clematis. Thank you Kris. Celebrating Cathy’s anniversary has been special. IAVOM has brought a lot of us together. Ha! Cathy, you’re right, I think the clematis is trying to make a break for freedom! Thanks. Thanks so much Elizabeth. That little begonia volunteered in a pot from last year and only began blooming in early October, so I felt it deserved to be included. I think the stems will root in water also so you get a bonus from using them. You have created another masterpiece of beauty….and I can’t get over all the flowers you have. I can see why your enthusiasm can’t be contained. Thanks so much Donna. 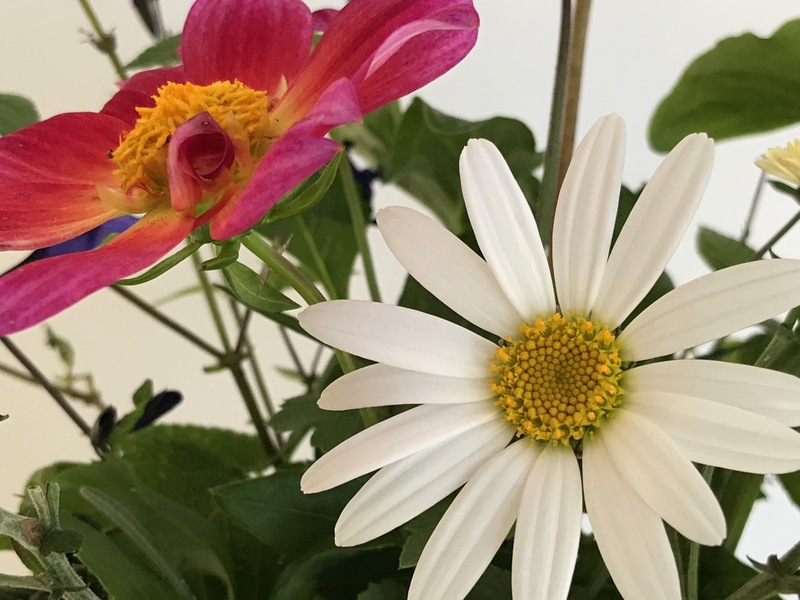 These last few blooms from the garden make me realize how the garden can carry on a bit even when we’re not able to nurture it as much as we’d like. I know you’re finding something similar with your garden. 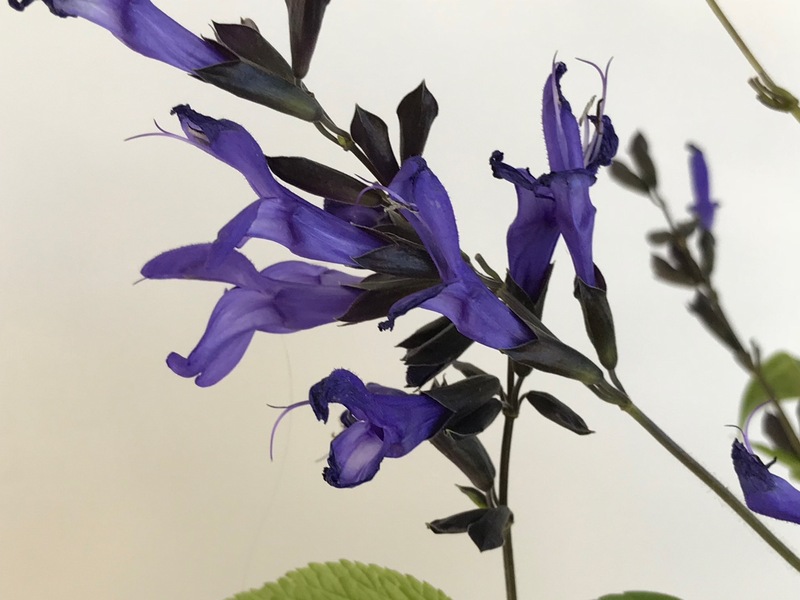 Haha – nice interpretation 🙂 Gorgeous blooms, especially the clematis and salvia (I like purple!). Yes, purple is a favorite for me as well! The jackmanii is truly worthy of your enthusiasm. Virginia Woolf loved these and wrote about them in To The Lighthouse. I am planning to plant one next year. That’s an interesting note about jackmanii. Hope you will plant and enjoy one. Thinking I should get another as well. Thank you. Glad we’ve become friends through our garden blogs Annette. Happy IAVOM celebration! 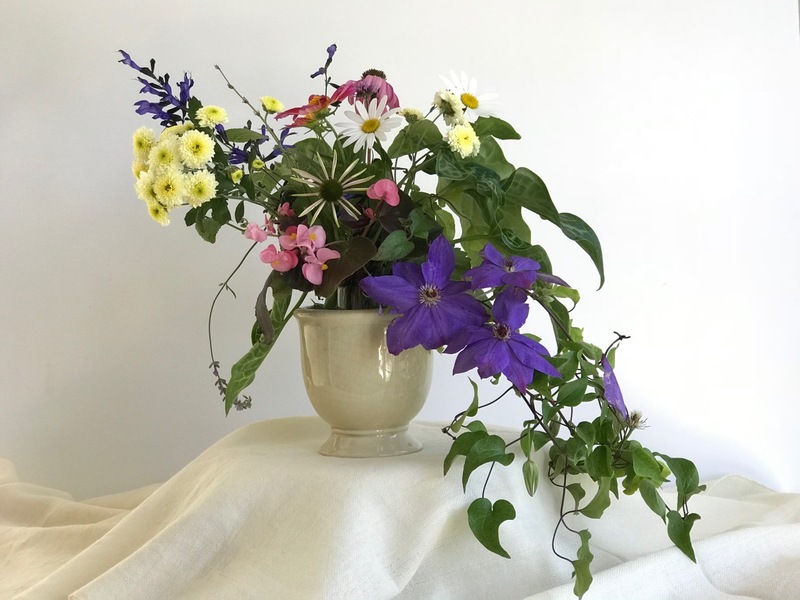 Like how you used the Clematis Jackmanii – very creative! Thanks. Your Jackmanii would provide endless vases, Jason! Mine didn’t bloom well this spring so happy it made a fall appearance.